PRISMA (PRecursore IperSpettrale della Missione Applicativa) was produced for the Italian ASI space agency by OHB Italia as prime contractor, with Leonardo responsible for the EO system. Operating from LEO, the satellite is designed to provide major applications for protection of the planet and for Italy’s national environmental safety. PRISMA is equipped with a state-of-the-art electro-optical instrument with a medium-resolution camera and an innovative hyperspectral sensor. Once operational, PRISMA will provide data for environmental monitoring, resources management, the identification and classification of crops, the fight against pollution and other uses. 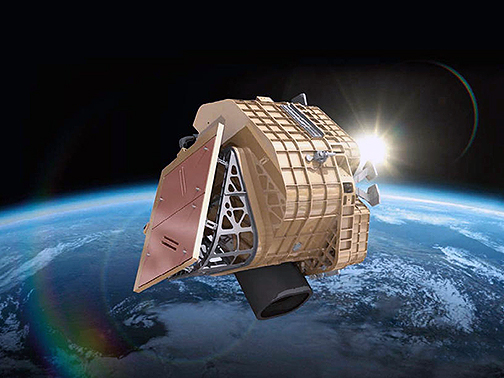 Artistic rendition of Italy's PRISMA satellite on-orbit. Designated Flight VV14 in Arianespace’s launcher system numbering system, this mission underscored the company’s role in deploying EO satellites, as PRISMA was the 70th spacecraft orbited by the company for this type of application. 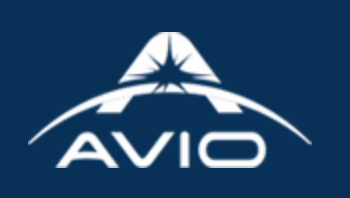 It was highly appropriate that PRISMA was orbited by Vega for Italy, as this lightweight launch vehicle is delivered for launch to Arianespace by Italian production prime contractor AVIO. After tonight’s Flight VV14, preparations continue for Arianespace’s next mission — Flight VS22 — which will use a Soyuz launcher to orbit four additional satellites for the SES-owned O3b satellite constellation. Flight VS22 is scheduled for April 4 from the Spaceport. Following the launch, Arianespace CEO Stéphane Israël said that with this successful launch of the PRISMA Earth Observation satellite, Arianespace has orbited its 600th satellite. The company is proud to continue performing the firm's primary vocation of ensuring independent access to space for Europe, with a focus this evening on Italy. 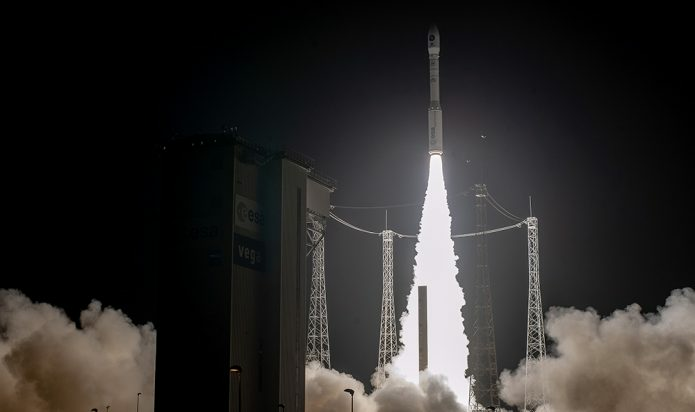 The mission, carried out for the Italian space agency, ASI, and the Italian industry consortium led by OHB Italia SpA and Leonardo SpA, illustrates the reliability of the Vega launcher, which has performed its 14th successful launch in a row. This launch also confirms the launcher’s attractiveness as a champion of the EO market, as Arianespace now has 9 Vega and Vega C in its launch order backlog. This third successful mission of the year, following launches by Ariane 5 and Soyuz last month, reflects the excellence and complementary fit of the Arianespace family of launch vehicles.